Massachusetts and New Jersey are considering measures to clear up the confusion, following a California law that went into effect earlier this year. Several other states also are looking at labeling bills, as anti-food waste groups advocate for clearer signs to indicate when food is okay to eat, even if it’s not the freshest. A bill that would establish federal standards for the labels, first introduced in 2016, has gone nowhere in Congress. Meanwhile, 43 states have their own rules, but they vary widely. Most limit labeling requirements to certain items, such as milk or shellfish. Some states prohibit the sale of past-date foods, and about half restrict donations of them. And the seven states without any laws leave it up to manufacturers. The result: confusion for retailers and consumers, who throw out tons of food that is perfectly safe to eat. Manufacturers largely include the labels to let retailers know when they should pull the product from their shelves, said Katy Franklin, operations manager at ReFED, a Berkeley, California-based nonprofit that focuses on reducing food waste. “You might think this product isn’t safe after the date, but what it really means is that this food is not at peak quality after this date,” Franklin said. 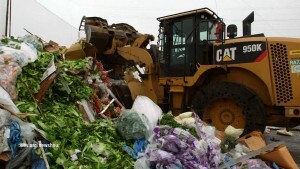 More than a third of the food in the United States goes to waste — about 400 pounds a year per American. Food is the largest category of waste in landfills, where it generates methane that contributes to global warming. Discarding past-date food is a huge cost for retailers. Meanwhile, millions of Americans are going hungry. But in the absence of clear definitions and standards, food manufacturers tagged foods with whatever label they wanted, leading to confusion that persists today. Advocates want the labels to be standardized and clearly defined, even if manufacturers continue to set the dates. Federal legislation introduced by U.S. Sen. Richard Blumenthal of Connecticut, and a companion bill by U.S. Rep. Chellie Pingree of Maine, both Democrats, would have established a national system limited to one quality date indicator (“best if used by”) and one safety date indicator (“expires on”). Food manufacturers would have been allowed to forgo the quality date indicator, but the safety date indicator would have been mandatory for a small group of perishable foods. The bill also would have eliminated state laws barring the sale or donation of food past the quality date, though states would have been allowed to prohibit the past-date sale or donation of expired foods. “The label that you see may mean a hundred different things to a hundred different manufacturers,” Pingree told WGME-TV, a Maine station, last month. She said she plans to reintroduce the bill this year. In a study published in February, researchers at the Johns Hopkins Bloomberg School of Public Health found that 84 percent of those surveyed discarded food on or near the package date “at least occasionally,” and 37 percent reported they “always” or “usually” discard food near that date, regardless of the words surrounding the date. “More than half of participants incorrectly thought that date labeling was federally regulated or reported being unsure,” the study said. The U.S. Food and Drug Administration offers a free “FoodKeeper” app to help consumers decide whether food is safe. But except for infant formula, the federal government does not require product dating. Food is the largest category of waste in landfills, where it generates methane that contributes to global warming. In 2017, the Food Marketing Institute (which represents grocers and other food retailers) and the Grocery Manufacturers Association (which represents food and beverage manufacturers) announced a voluntary standard, paring down the numerous labels to two: “best if used by,” referring to product quality, and “use by,” referring to safety. But the voluntary labeling has done little to end the confusion, said Roni Neff, assistant professor and program director at the Johns Hopkins Center for a Livable Future, which oversaw the report. But Meghan Stasz, vice president for packaging and sustainability at the Grocery Manufacturers Association, thinks the voluntary system should help ease confusion. Stasz said the group’s 300 companies are phasing in the labels, and that 87 percent of members’ products already carry them. The system should be fully phased in by next year. If there is a public information campaign, it would begin at that point, Stasz said. The state bills pending in Massachusetts and New Jersey both call for only two categories. California’s new law, which is the most comprehensive state law, requires the state Department of Food and Agriculture to encourage food processors to use uniform terms on food product labels — “best if used or frozen by” and “use or freeze by” to communicate quality and safety dates. But except for infant formula, the federal government does not require product dating. Under the California law, “best if used by” or “best if used or frozen by” indicates the quality of the product, and “use by” or “use or freeze by” indicates the safety of the product. But neither label includes a definition to help consumers determine when they should discard it. California state Assemblyman David Chiu, author of the 2017 law, said major food manufacturers have begun to use the labels, but many smaller manufacturers have not. The California bill does not require date labels, but if a date label is put on a product, it must use one of the two standard phrases. Chiu, a Democrat, said he hopes other states will follow California in approving standardized labels for all processed foods. “Every part of the food chain is throwing out food that could be eaten,” Chiu said. Massachusetts state Sen. Edward Kennedy, a Democrat who authored the labeling standardization bill pending in his state, said a voluntary standard is not enough. “The thing is, nobody knows what that means. If you have a ‘sell by’ date, and it’s beyond the ‘sell by’ date, you may know you can consume the food, but you don’t know for how long,” he said. New Jersey state Sen. Linda Greenstein, a Democrat who has championed a similar bill in her state, agreed that the current labels are far too confusing for consumers. “Anything we can do to make food labeling understandable to people is a good thing,” she said. Left: Discarded food is readied for the landfill.